I can’t remember the exact age I was when I first saw Barkerville – seven, maybe eight years old? My sisters and I had gone to stay with family friends for two weeks, just outside Quesnel. They lived in a log house that was only partly finished, so you could look right through the walls. The household had no television – a revelation to us – and every night we sat by the fireplace and sang songs. The stage was set for a prime visit to the Victorian era. One day our friends announced that we were all going to a town where everyone was “in the olden days.” I was stoked. I was little enough that I could still believe it was entirely possible to walk right into another century; a century peopled with real gold rush characters. The exact details of our visit to the heritage site that would come to be a defining factor in my adult life are, understandably, fuzzy. This was about four decades ago. But there are moments of that day, way back in the 1970s, that have stayed in sharp focus over the years. We sat in the front row at the Theatre Royal and the show was the funniest thing we had ever seen. It was a vaudeville-style revue, and both of my sisters and I, now firmly in our 40s, can still sing a rousing rendition of “Eary Wigs and Whopsies”- the afternoon’s show stopping number. We rode the stage coach, which at that time took us up the old Waggon Road to the cemetery. We sat on top, in the bench seats, and I recall the driver telling us that, no, Billy Barker was not buried there. Today my husband and I took our four year-old twin girls to Barkerville for the first time this season. They are at the perfect age to really appreciate the wonder of the place, to be swept away in the convention of traveling to another time. We were delighted by our daughters’ joy in playing with the coffee grinder at the Wake up Jake, something we have watched generations of other kids do. We brought them over to talk to the big horses, bought them wooden whistles and whirly gigs at the Mason and Daly, and exotic treats in Chinatown. But the most interesting thing happened when the girls had their first “in character” interpretation experience of 2013. 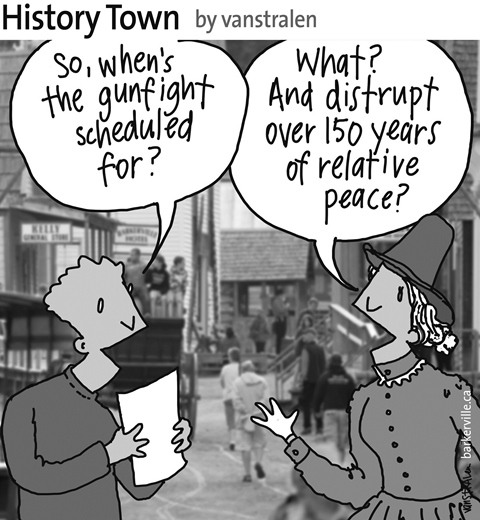 I guess there are drawbacks to growing up with historical interpreters for parents. The above one-panel cartoon by Dirk Van Stralen, along with the accompanying editorial by Danette Boucher, is the fourth of twenty weekly entries that will be logged – and subsequently blogged – as part of a 2013 collaboration between Barkerville, British Columiba and the Prince George Citizen aimed at introducing some of the quirkier advantages to living, working, and playing in the Cariboo Goldfields. We hope you enjoy!